Elkagorasa the Casual: Elk likes it..
Last night after a fail raid. (Magmaw 10, OOT 0), one of my trusted warlock guildies (playing the role of healer last night) said, "Hey Elk, ever consider running a Demonology build? You get some massive AOE damage." Had I? Actually never. 4 and a half years, and I've never, ever ran a demo build. So, after the excitement of 80k dps AOE's I thought "Now is the time". After clearing those 31 points out of my incomplete Affliction build, I pull up my guildie's Armory page and grab her Demo build. OK, some new spells, new priorities. Hand of Guldan? Fly up to the training dummies, summon my Felguard, "Thoosas" and try out a sample rotation. Shuffle my buttons a bit and try again. OK, rebuild my buttons to match closer to my Destro buttons (fel flame and soulburn on B4 and B5, etc.). Once, I get it where I think it should, queue for a PVP run, cuz battlegrounds are my spell rotation, talent build and gear testing ground. For once, I get an instant queue, Nice! Twin Peaks. Twin Peaks, in case you haven't run it before, is a mini Warsong Gulch. You both have flags, and need to run the opposing team sto your own base. When your flag is in the stand, you can 'capture' the opposing team's flag. 3 captures to win. This is a rather fun bg. 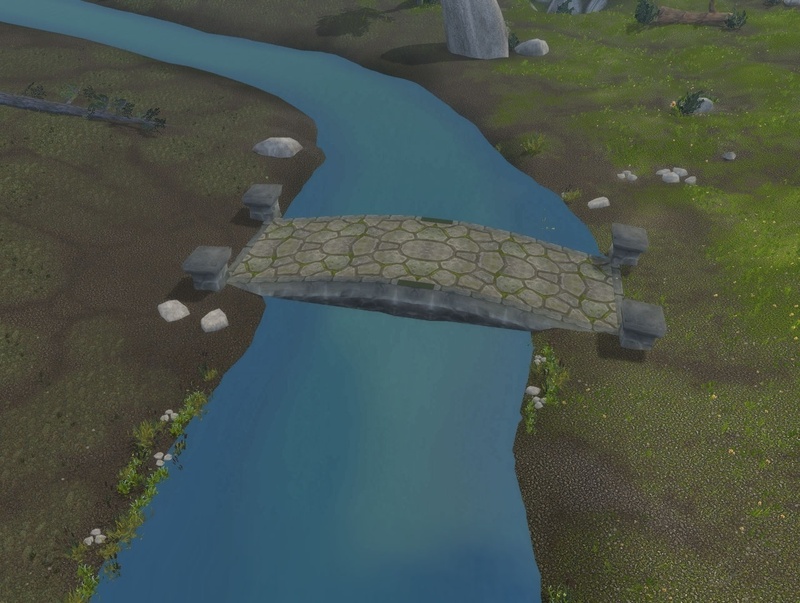 The river in the center, creates both a barricade and squeeze point if you cross at the bridge (dpsing swimmers is like shooting fish in a barrel). Once I got past the different spell rotation (what does this yellow wings aura mean? ), I found the differences between the specs fun. Demonology is quite a bit more survivable. With the shared damage with the felguard, you can take quite a bit. If that doesn't mitigate it, every 30 seconds 3 minutes, you can go demon form and rampage the countryside (for 30 seconds). Second, I hardly ever ran out of mana. Only during a 3-minute long duel with a dwarf something-or-other, did I find myself out of mana. (Thanks healer, that was awesome). Destro, I would have had to tap at least 2-3 times to do the same fight. AOE while on the run. I ran up beside the flag carrier, turned on the immolate aura and kept casting my dots. I was also able to fire up the Hellfire and do even larger damage area. Monday, when we take on Magmaw again, I'll have my demon form, and my felguard's spinny-ftw-y attack. Goodbye lava parasites, full win for OOT. (and maybe an epic dagger for Elk)! My guild tells our warlocks to go demo for aoe fights too, I wish they were as enthusiastic about it as you are. They're more of "ok, fine, I will" *dramatic sobbing on TS* I knew it wasn't that horrible! Despite a bit of a learning curve, it's not 'horrible', just different. They play a middle ground of affliction and destruction. Shadow dots and fire spells. Hand of guldan is a shadow spell, Molten Core procs Incinerates. So you live in this middle ground weaving dots and direct damage. I do miss my instant cast aoe stun from destruction. Just need to time my meta form, so I can use Demon Leap better (still a 3 min cd, vs the 30s cd for shadowfury). Just so you know, the Impending Doom talent causes your Shadow Bolt, Hand of Gul'dan, and Incinerate to have a chance to reduce your Metamorphosis cooldown. I find while raiding that it often ends up lining up fairly closely with Demon Soul for extra punch. There is a talent to make your Hand of Gul'dan do an AoE stun, but it's rather underwhelming.